Templates are huge time savers. They generally have a custom design with slide layouts and content placeholders. They may even include media, animations, interactive objects, variables, and triggers. Just add templates to your courses, then customize the content to fit your situation. You'll have inviting scenarios and engaging interactions in mere minutes! Articulate Storyline has a library of ready-made templates, but you can add more. 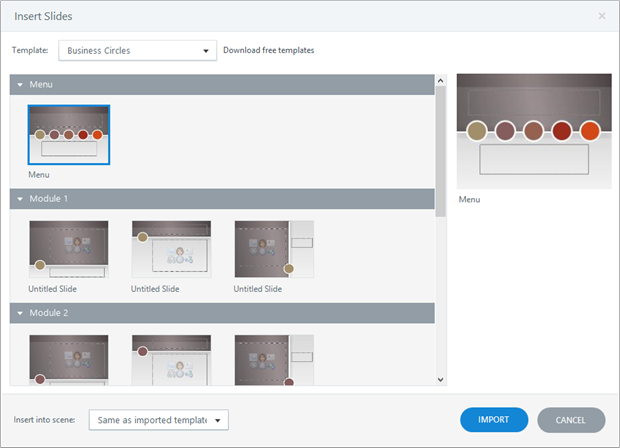 Download free templates from the Articulate community, collect them from other course developers, or create your own. When the Insert Slides window appears, select the Templates tab on the left, then choose a template from the drop-down at the top of the window. If the template has more than one slide, Shift+click or Ctrl+click to select the ones you want to add to your course. Tip: You only need to select one slide to add the template to your project file. Thereafter, you can add more slides to your course from the same template using the Basic Layouts tab. Current scene: This adds the slides to the current scene. Same as imported template: This adds the slides to the same scenes that the template is using. If those scenes don't already exist in your course, Storyline will create them for you. New scene: This adds the slides to a new scene in your course. When you choose this option, an additional Scene field will appear, where you can specify the name of the new scene. Go to the File tab on the Storyline ribbon and click Save As. Browse to the location where you want to save your template. Tip: Storyline will save a copy in the location you specify and another copy in your "\Documents\My Articulate Projects\Storyline Templates" folder, which is where the Storyline library is kept. Give your template a recognizable File name. Use the Save as type drop-down to choose Storyline Template (*.storytemplate). Now you can reuse your custom template in other Storyline projects using the steps in the section above. To share a custom template with other content developers, just send them your *.storytemplate file. They can import it into their Storyline libraries using the steps in the next section. Importing a new template into your Storyline library is as easy as opening the *.storytemplate file you downloaded from the Articulate community or received from another content developer. Launch Storyline, click Import, choose Import from story template, then browse to the *.storytemplate file. When you open a *.storytemplate file, Storyline assumes you're ready to create a new course. The Insert Slides window will appear. If you just want to add the template to your library, you can click Cancel and close Storyline at this point. (The template will now appear in your library.) If you want to continue building a new course from the template you've opened, Shift+click or Ctrl+click to select the slides you want to add to your project, then continue to the next step. Current scene: This adds the slides to a new scene with a title that matches the name of the template. Same as imported template: This adds the slides to the same scene(s) that the template is using. Storyline will create a new project from the slides you selected, and a copy of the template will be added to your library for future use. Tip: The location of the Storyline library on your computer is "\Documents\My Articulate Projects\Storyline Templates." Another way to add a template to your library is to move the *.storytemplate file into this folder. Then rename or delete the *.storytemplate files found in the folder above.